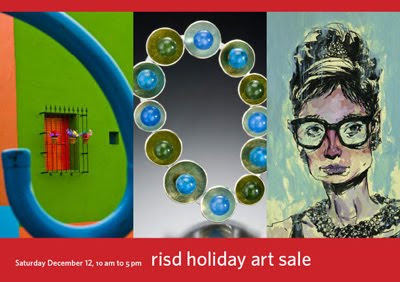 The Brunch & Buy is a tradition that my arty mother and some of her arty friends started many years ago. (The first one I was probably 12 or 13 and I made about $60 selling...journals? It was, at the time, a lot of money and very exciting.) This year, I made the flier. 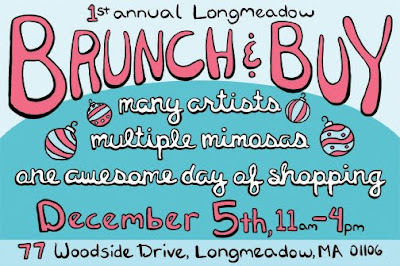 It's out in Springfield/Longmeadow, but if you're in the area, you should stop by to see the house I grew up in (kinda) and meet my mom and some other amazing artists and also to eat some delicious food and buy some gorgeous work. I will be bringing banana bread, if that makes the decision to go easier. The file folders (the low green cabinet) came from a friend of a friend of a friend; an illustrator who might be moving to Jamaica Plain and is getting rid of some old equipment in the meantime. The cabinet is inhumanly heavy (which is why it is on the floor and not on the table, as in my original plan) but the drawers slide nicely, and I was able to fit all of the work that Josh and I had hung onto from RISD. Looking through my past work...well...has me feeling pretty proud of myself. Sometimes illustration is a struggle for me, and I'm still finding my voice and my style, but I feel very, very lucky to have learned from teachers and fellow students who took me seriously, and taught me so much, despite my (obvious, gaping) weaknesses. Coming next week: I'm either going to post work from the Massive Freelance Project or some of the less embarrassing RISD stuff. Cheng & Tsui will decide.